The first thing you should do is install some addons. You should at least install the general auction house addons and then as you start farming, install the farming addons, etc. Addons are what makes World of Warcraft incredibly easy and convenient for everyone: raiders, farmers, gold makers and PvP'ers alike. As a matter of fact, addons seem to be the break through for a lot of new players. I receive a lot of emails from new profiteers who make 5,000-10,000 gold in the first few days after installing addons, organizing their bags, setting up an auction alt and selling the stuff they already had! It's a real pain to sell items without the right addons. If you don't have the following addons installed you will be missing out on taking advantage of the Auction House and making things easier for yourself, which in turn makes you a lot more gold. I use the Curse Client available at curse website to download, install and manage the versions of all of my addons. You can also install them manually, by unzipping the compressed addon files and moving them into your World of Warcraft/Interface/Addons folder, however if you're not proficient with your computer I don't recommend doing that. The Curse Client has served me well for years. Below are brief introductions to the addons you will want to use and familiarize yourself with. The list is in no particular order. If I had to make gold with only one addon I would choose Auctionator. It provides an extremely intuitive and simple interface for scanning item prices current and historic, posting auctions, buying items and checking up on existing auctions. I have an entire section dedicated to the use of this addon in Chapter 1 - The Auction House. You should install this addon now, though, and familiarize yourself with it as much as you can. Transmogs are a huge seller and there are plenty of WoW Gold Farming methods. popular crafting addons, such as Little Sparky's Workshop. Install and familiarize yourself with this addon if you intend to buy and sell items on the Auction House. to overcome that so that we can be the ones making gold in Mists of Pandaria. players who just farm. If you're not using it you're probably doing way too much manual work. • It lets you post a large number of items extremely quickly. • It prices items for you based on a set of rules so you don't have to check prices. • It lets you forget which items you're selling and basically sells them for you. • It remembers how much gold you want to see each item for. Combined, these features allow you to enter new markets with only a small initial investment of time. Unfortunately, it can take 10-15 minutes to actually figure out and understand how TSM works the first time you use it. It's worth it though. To get started, I'll walk you through the most basic way to use TSM_Auctioning. associated with it. Although, we'll only be using TradeSkillMaster_Auctioning today. Use your main auction character to set this up. If you don't already have something in your bags buy a stack of Windwool Cloth or something. In the example below I will use Borean Leather. Just make sure your character has at least 1 trade good in its bags that you're willing to sell. TSM options by typing /tsm. This is where stuff gets crazy. There are options and text everywhere! Don't read any of it (for now), just click the "Auctioning Groups/Options" button on the right. Now we're going to create a group. This is the most powerful feature within TSM. click 'Add' in the middle. and it will bring up the group's "overrides" that's a fancy/confusing way of saying "options". right click and then read the tooltip. • Bid percent: Use 100% to avoid having items bought below your threshold. • Fallback price: 9 gold 99 silver - I figure this is the highest people will pay per Borean Leather. This price is only used when no other stacks of Borean Leather are posted. 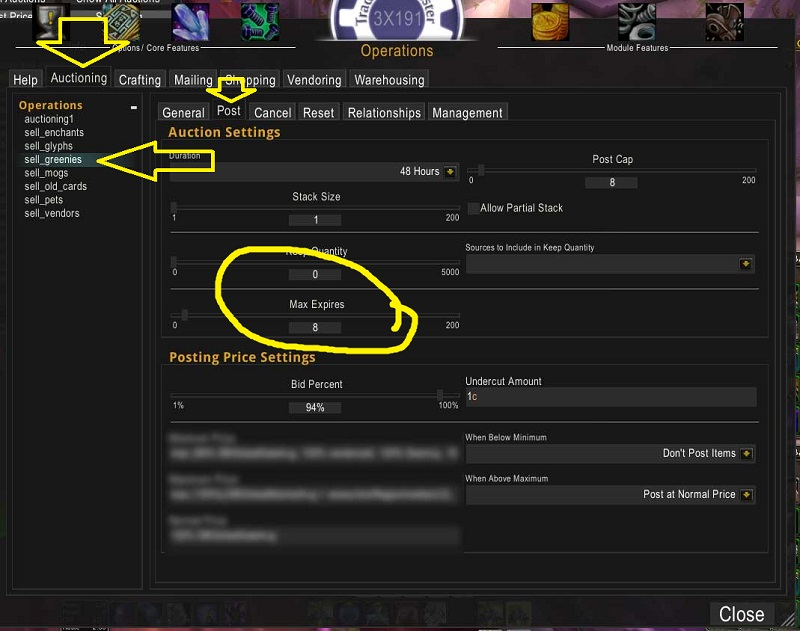 Visit your auction house, click the TSM tab on the bottom and click 'Post Auctions' on the left. This won't really post your auctions (yet), it will start by scanning the items that you have which are configured in a group. In my case, it searched for Borean Leather and notified me that it was time for me to sell Borean Leather. Usually there are more than 1 'Postings' in the upper part of the main area. Each time you click 'Post' at the bottom it will post the next auction. There might be 0 postings the first few times you run scans. If so, just leave and come back later. All that means is that none of your groups triggered a posting. You can use this to sell hundreds of glyphs at once (see the professions chapter in the SGG for more details) or you can just use it to auto post the materials you farm, buy from vendors or buy in trade chat. KTQ is an addon made for a very specific purpose: queuing up the creation of a large number of crafts. It's used mostly with crafting professions when you might craft 20-200 different items in a row. GnomeWorks is a profession UI that replaces the default Professions window, it's required to use KTQ. These two addons will be used in conjunction with Altoholic to do some extreme automation later in this guide. You won't need to use them until then, but they are worth installing and learning about. you use the Curse Client you can select 'Install' in the upper right to automatically install it. Otherwise you will need to download and manually install the addon. Altoholic is an addon that stores information about what each of your characters are wearing, have in their inventory and have posted on the Auction House. This is an extremely valuable addon to have when using multiple characters to make gold in WoW. For example, if you are crafting items on your Tailor and need to know how many Brilliant Spellthread your alt has, all you have to do is move your mouse overtop of an existing Spellthread and it will tell you how many you have on each character in their bags, mail box and posted on the Auction House. Wow legion gold farming guide for anyone who wants to check out how to farm gold in Legion.